Grown, manufactured and packaged in the heart of America, Amish Country Popcorn is popcorn as it should be—made without toxic additives, allergens or high-calorie toppings. 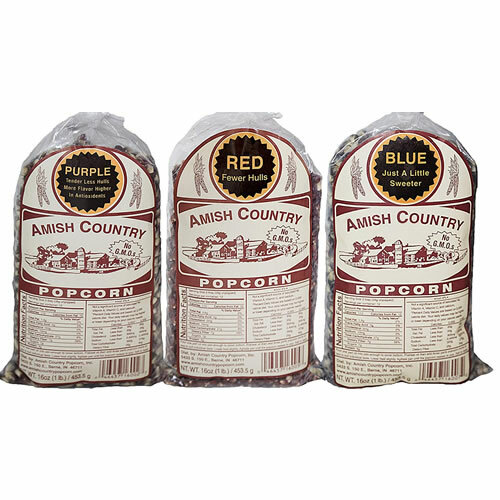 You will recieve a loved variety pack by Amish Country Popcorn, including Purple, Blue and Red. Purple popcorn for you to enjoy. It has small, nutty kernels. A very good and tender popped kernel, a great “eating corn”! One of our favorites! This variety may be limited in supply. Blue pops medium to large, has its own flavor, yet it’s actually a little sweeter.Lately, it has been becoming many people’s favorite.There are not a lot of hulls. Red is a hybrid very similar to medium white popcorn, but it has its own distinct characteristics. There aren’t many flaky hulls, so this popcorn pops up fluffy and meaty white every time. It is a favorite of many.